Viz Media’s been dropping little bits of news throughout the past few weeks, resulting in plenty of good news for print fans. Time for a round-up! Coinciding nicely with the recent addition of its anime to Crunchyroll, Jojo’s Bizzarre Adventure is coming back to print. Viz Media has released sixteen volumes of the series but individual volumes have been difficult to find after going out of print. Fresh volumes are said to be arriving in their warehouse starting this month so retailers such as Amazon and RightStuf will be able to start fulfilling orders again. Pokemon is getting some new packaging with three upcoming boxsets for the various manga series. Bundling the individual volumes into ‘season’ sets, Viz Media has three sets coming in the Fall – Pokemon Adventures: Ruby & Sapphire, Pokemon Black & White Set 02, and Pokemon Adventures: Diamond & Pearl/Platinum. More information is available via their press release. Blue-Eyes White Dragon YU-GI-OH! Collectable Trading Card”. The Jump Packs are great ways for those without the ability to purchase online to still get subscribed to Viz Media’s Weekly Shonen Jump. I love that they’re continuing to offer this option and the cost is entirely worth it. Yen Press’s new manga titles weren’t the only treat they had in store for Sakura Con 2014. The publisher also announced a brand new imprint – Yen On – dedicated to the publication of Japanese light novels. As the name directly implies, light novels are novels only… light, meaning not as dense or lengthy as most novels we’re accustomed to. They also have accompanying artwork inside. A publisher for light novels is something I’ve seen plenty of interest for, but of course seeing interest from inside the anime/manga fandom isn’t necessarily indicative of an actual support base. Though many light novels are original properties – with the most popular receiving manga and anime adaptations after the fact – they’re still mostly seen as simply counterparts to their other more popular connected mediums in North America. Cute anime girls on covers also aren’t a big selling point for the average reader like they are in Japan, as evident by Yen Press’s decisions to sell the original volumes of Spice & Wolf with new photo-realistic cover art. I can’t say if those had any positive or negative affect on sales but it was certainly a thing that happened. So how about Yen On then? If any publisher was going to do this, I don’t think anyone’s surprised it’s Yen Press. The manga publisher has already released several light novels including The Melancholy of Haruhi Suzumiya, Sword Art Online, and the aforementioned Spice & Wolf. I’m curious to see if they’ll keep promotion focus on the existing anime & manga fan base, or if they’ll continue trying to push light novels to the wider young adult reading audience as well. Where will I see these books shelved in Chapters & Indigo stores in 2015? Another is a title I know from Yen Press’s omnibus release of the manga last year, a creepy horror story that had me almost leaving the lights on when I went to sleep. It’s about a class of students haunted by a vengeful spirit, one who appears among them as an extra classmate and brings about gruesome deaths. Yen Press previously released the Another novel back in 2013 but in digital format only. This October they’ll be launching their new imprint with a hardcover print edition of Another that includes both volumes combined into one. A Certain Magical Index is also a title I’m familiar with, but by reputation only. This light novel series has spawned multiple manga series and an anime. The story is set in a world where people have supernatural abilities, but political and societal struggles erupt between different factions of these individuals depending on how they gained their powers, plus what they are. The main setting for the stories is a technologically advanced academy where students with these abilities reside. Yen On’s first volume of A Certain Magical Index is scheduled to be released this winter. Last but not the least bit short in name is Is It Wrong to Try to Pick Up Girls in a Dungeon?. I’ve seen the joke about long light novel names plenty of times, so Yen On launching with a title like this seems a perfect fit. As for the story itself, the series is set in a fantasy world where a floundering adventurer teams up with a failed goddess. The author of IIWTTTPUGIAD is new to North American publication but the artist, Suzuhito Yasuda, is known for their manga series, Yozakura Quartet, which was published by Del Rey. The first volume of IIWTTTPUGIAD is due sometime this winter as well. Legal Drug is a three volume series by CLAMP that was originally released by Tokyopop. The series went on hiatus in Japan, leaving fans of its boys’ love heavy subtext and mysterious unresolved plot left wanting. Rejoice however as CLAMP did eventually continue the series, titling the continuation Drug & Drop, which until now has never been released in English. Dark Horse will be releasing an omnibus book collecting the three volumes of Legal Drug, the same treatment they’ve given to several other re-released CLAMP series including Cardcaptor Sakura, Tokyo Bablyon, and Angelic Layer. The omnibus will have a new translation and shiny new print, and likely with some bonus colour illustrations as well if Dark Horse’s past omnibus are any indication. Legal Drug is scheduled for September 2014 at $19.99/US, $21.99/CAN. It can be pre-ordered on Amazon.ca | Amazon.com. The first volume of the sequel Drug & Drop will be released in January 2015 for $11.99/CAN, $10.99/CAN. It can be pre-ordered on Amazon.ca | Amazon.com as well. Currently there are two volumes in Japan for the series with new chapters on-going. Both series follow two young men who work as errand boys for a strange shop that sends on supernatural jobs. More mysterious than even their work is the pair’s back story, and the true purpose behind their employer’s store. I will sum up the CLAMP news by saying THANK YOU, DARK HORSE! Signed, a huge fan of everything CLAMP. Dark Horses pleases another fervent fan base with their license of Oreimo: Kuroneko. The series is a spin-off to Oreimo which Dark Horse has released four volumes of to date. This three volume spin-off stars the original’s secondary female lead, Kuroneko, as the main heroine. Volume one will be released in April 2015. OPUS is a manga title by acclaimed film director, Satoshi Kon. Perfect Blue, Tokyo Godfathers, or Paprika anyone? This two volume series is being released by Dark Horse as one omnibus book. OPUS predates Satoshi Kon’s film career, and follows a manga artist who is pulled into his own creation. Dark Horse’s second license drawn by Satoshi Kon is Seraphim: 266613336 Wings, which is one heck of a name to remember. The one volume title is written by Mamoru Oshii, famous for quite a few titles in his own right. Seraphim is about a group of individuals on a journey to discover the truth behind a deadly ailment called “the angel disease”. Dark Horse’s edition will ship February 2015. King of Eden immediately grabs attention with its author, Takashi Nagasaki. He co-authored the majority of Naoki Urasawa’s most popular series, including Pluto, 20th Century Boys, and Monster. I didn’t actually know this until reading Yen Press’s introduction to King of Eden, and this new knowledge ensures I’ll be keeping an eye out for Takashi Nagasaki’s name in the future. This is the artist, SangCheol Lee’s, debut professional work. Yen Press describes King of Eden as “a sweeping new masterpiece of the grotesque”, beginning with a village massacre and the capture of the killer responsible. They’ll be doing a simultaneous publication of King of Eden starting May 1, 2014 – only two days from the time this post goes up! Gou-Dere Sora Nagihara – which I’m going to have one heck of a time trying to pronounce to my local comic store if I choose to order it – is an amusingly perverse sounding story that reminds us to be careful what we wish for. A young man wishes that his beautiful beloved manga heroine was real, only to suddenly find himself face to face with her. However to his surprise she’s not the docile woman he’d always read about and now he has to learn how to deal with her very forward and overprotective nature. Gou-Dere Sora Nagihara is scheduled for November 2014. This will be the second Suu Minazuki title released in English, the first being Tokyopop’s completed Judas. In contrast to that pervy romantic comedy comes Love at Fourteen, a romance Yen Press describes as “a charming, bittersweet slice-of-life story” for those who “have a soft spot for subtle (not to mention adorable) romance”. The story is about two mature-for-their-age teenagers falling in love in junior high. Admittedly nothing about that description is much of a grab. Teenagers falling in love… okay, we’ve read that a million times. The artwork though – pictured above on the right – does look really charming. I believe this is Fuka Mizutani’s first title to be released in English as well. I’ll likely give the first volume a try when it’s released this November. The title that did get me giddy right away was The Angel of Elhamburg. I own both Aki titles that have been released in English previously – Olympos by Yen Press and Utahime by Digital Manga. I was immediately smitten with Aki’s gorgeous artwork (pictured above to the left) and thoughtful writing. The stories are more emotional than plot-driven and have given me food for thought on more than one occasion. I’m really excited to own another Aki book, plus see how Yen Press handles the publication after their beautiful work on the single volume, Olympos. The Angel of Elhamburg is about a knight and his king when their friendship is strained by jealously, all as an angel overlooks their lives. This one-shot book is scheduled for Spring 2015. In the meantime you can see sample pages for The Angel of Elhamburg on Amazon.jp. Along with all those lovely looking manga titles, Yen Press also announced an art book for Jun Mochizuki’s Pandora Hearts, titled Pandora Hearts ~odds and ends~. Yen Press’s past art book releases – which have included Kingdom Hearts and Soul Eater – are fantastic quality and definitely collectible items worth every penny. I’m confident Pandora Hearts‘ fans are in for a treat! Toronto Comics Art Fest just keeps sweetening the pot for its attendees, and possibly proving itself to be the best venue for meeting manga artists in North America. TCAF organizers recently announced that manga-duo Akira Himekawa would be attending as one of their 2014 featured guests. Akira Himekawa – who is actually two women who work together under the singular name – is best known to North American manga readers as the artist behind The Legend of Zelda manga series that are published by Viz Media. They’re currently working on the official My Little Pony manga in Japan. Along with autograph sessions and interviews, the two manga artists will be participating in live art demonstrations and a panel about women working in the manga industry. As someone who eagerly collected all of The Legend of Zelda manga – and was really impressed with the quality and artist’s ability to shift their style to suit each individual game – you can bet your manga-reading butts that I’ll be doing my best to attend each of those events. We don’t hear of manga artists being brought to conventions here nearly enough, so I’m completely thrilled we’ve got four now coming to TCAF 2014. How amazing is that? And they’re no small names either. Akira Himekawa joins the already announced est em and Moyoco Anno, not to mention the large assortment of other artists from around the world. TCAF 2014 takes place in Toronto, May 10th-11th, and is free to attend. Raqiya certainly sounds interesting to me! I hope it’s a scary one, as good horror/suspense manga has been severely lacking on my bookshelves as of late. For those curious about the artist’s work, Boichi’s series Sun-Ken Rock is currently available to read on Crunchyroll. He also had a story published in Dark Horse’s Trigun: Multiple Bullets anthology. No Game, No Life is a manga adaptation of the light novel of the same name. The story is about a brother and a sister who have garnered an internet-wide reputation for being brilliant gamers, but are also chronic shut-ins. One day they’re suddenly transported to another world where everything from politics to finances are determined by the outcome of games. The brother and sister who couldn’t contribute to their society at home may have found the chance to offer this new world their particular brand of expertise. The timing of this license is well chosen as the anime adaptation of No Game, No Life is scheduled to air next week. The wait for the manga is a bit longer than that, but for those who watch and enjoy the anime, the timing should work out nicely. The first volume of No Game, No Life is scheduled for October 2014. Sharpen your pencils and plug in your tablet – Viz Media and We Love Fine have teamed up to hold a Bleach t-shirt design contest! And it’s awfully cool. The rules are pretty simple – do an original t-shirt design using Bleach characters or symbols, and submit! You can’t use any official artwork or the Bleach logo, but fanart and snazzy designs are accepted and encouraged. The grand prize includes a paid-trip to Anime Expo, and multiple cash prizes through the tiers of winners. One design will be chosen to be sold as t-shirts in Hot Topic, while all winning designs will be considered for print and sale through We Love Fine. 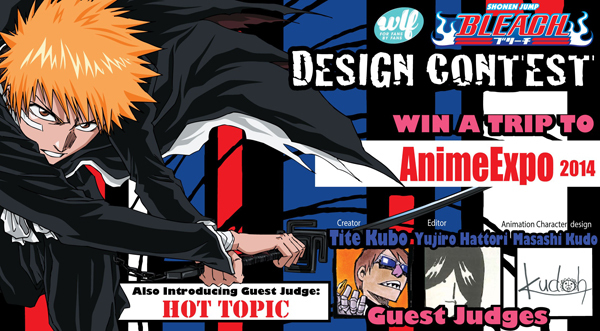 The judges for the contest are nothing to sneeze at either – Crunchyroll, Hot Topic, Masashi Kudo (editor of the Bleach manga), Yujiro Hattori (character designer from the anime) and Kubo Tite himself, creator of Bleach! The deadline to submit is April 8th, 2014. Good luck and much fun to all those who submit! The Heroic Legend of Arslan series was originally a light novel, and has since been adapted as multiple manga series and an animated mini-series that Central Park Media released in English. Ah, my high school anime club days. The series follows a young prince named Arslan, who is the only remaining son of a deceased King and now the heir of a country at war. Arslan and an unlikely, and vastly unnumbered, group of warriors work together to try and take down an army of thousands to save his country. The artist for this manga adaptation if Hiromu Arakawa, best known for Full Metal Alchemist (one of my all-time comic favourites), and is currently releasing Silver Spoon. While I’m over the moon happy that Kodansha Comics has licensed The Heroic Legend of Arslan, my excitement was a bit smaller than it would’ve been had Crunchyroll not announced acquiring the series for simulpub just a couple weeks ago. Arslan and more Arslan! I’ve since read all the chapters Crunchyroll has, and am very eagerly awaiting the next installment. And the first printed volume when Kodansha Comics releases it in print this August, of course. I want this beauty in print! The Heroic Legend of Arslan (Vol. 01) is available for pre-order now from Amazon.ca | Amazon.com. Kodansha Comics did announce they’d be releasing the book digitally as well, so I suppose we can assume simulpub now from Crunchyroll, digital compilation from Kodansha Comics and a print edition following that. With so many hopes riding on digital delivery giving certain higher-risk series a chance at English release, it almost seems a little silly watching titles licensed by multiple companies in multiple formats. Although, it’s not that surprising seeing a company as big as Kodansha – parent company of the English arm, Kodansha Comics – splitting the piece of manga pie for some of its titles. Arslan isn’t the only title announced this month that is having a publisher time share after all. This book will be a release of Lewis Carroll’s original Alice in Wonderland novel, coupled with new adorable artwork by returning Seven Seas’ artist, Kriss Sison. The book will include full-colour illustrations and over a hundred black & white illustrations. “Alice’s Adventures in Wonderland and Through the Looking-Glass is a collection of stories featuring the titular character, Alice, and her misadventures through the curious and fantastical lands of Wonderland. As little Alice goes deeper and deeper down the rabbit hole, she meets an assortment of oddball characters, like the eccentric March Hare, the whimsical Mad Hatter, and the enigmatic Cheshire Cat, who will all become familiar faces within this strange world. Alice in Wonderland is scheduled for August 2014 and will cost $16.99/CAN, $14.99/US. The Alice in the Country of… series that Seven Seas and Yen Press have been releasing shows there’s a hungry audience for the material. While the original won’t have the romance that its numerous based-of works focus around, Kriss Sison’s artwork is gorgeous and will have plenty of eye-catching character designs to draw people’s eye. I’m actually really looking forward to reread the original story but with this pretty artwork colouring my mental imagery as I go.